There’s the unexpected dog with a penchant for howling, house alarm that won’t stop going off, and a papergirl with a grudge.There are the relatives who aren’t speaking, the (awful) girl her favorite brother brought home unannounced, and a missing tuxedo.Not to mention the neighbor who seems to be bent on sabotage and a storm that is bent on drenching everything. The justice of the peace is missing. The band will only play covers. The guests are all crazy. And the wedding planner’s nephew is unexpectedly, distractingly…cute. This book was pretty good – Matson is living up to expectations! I’ve always been a Matson fan since I started reading YA, with Amy and Roger being my favourite, so I couldn’t help but pick this one up. I loved so many things about this book! It was so family orientated, which was lovely. 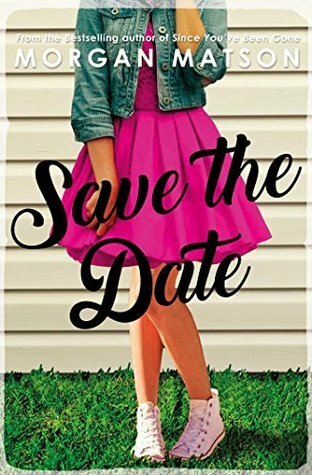 I really feel like families take a backseat in YA and they’re rarely featured as much as family is in Save the Date. It made for a fresh feel, although I did want a little more romance in some parts. I flew through this book and finished it within a few days, mainly because so much happened! It’s crazy how this book took place over 3 days, and yet it span over 400. It was just so fun and hectic! So many silly things happened, that I actually ended up laughing at the pure craziness of it all. With the amount of things going wrong, the book ended up being really entertaining and just made me want to read on and on. I had mixed feelings about Charlie, but I actually really liked her in the end. Some of her decisions and feelings really annoyed me – her focus on her family can be a little over-the-top at times and can cause her to just be mean to others. But these are just mistakes that teenagers make. All of the tiny things I didn’t like about her, she actually rectified before the end of the book. I loved watching her grow and learn from her mistakes, and make new decisions about her life.